Today is the 200th anniversary of the publication of Pride and Prejudice! To celebrate, I thought I'd pick out a few of my favourite costumes from recent adaptations of the novel and other works by Jane Austen. Let me know your favourites in the comments, and why not celebrate the anniversary by reading a bit of Austen? You can also read my post for Winchester Fashion Week about style in Austen's time here. This may well be my favourite Austen adaptation ever - and that's not just because it has Dominic Cooper and Dan Stevens in it (though that's certainly a contributing factor). I just thought Charity Wakefield was a flawless Marianne, and her costumes are all lovely. For some reason though, I became obsessed with this patterned yellow day-dress. I think I just loved the young, fresh feel it had, and the way it matched her hair tie. This dress, a picnic, and Dominic Cooper reading me poetry and I think I could die happy. Lots of people don't like Mansfield Park very much, and neither do they like its heroine. I'd say it's actually my favourite of the books, and also the one which hasn't had a completely satisfactory adaptation made of it yet. I did like Billie Piper in this version though, and this dress from the final scene took my breath away. It's covered with thousands of pearls, making it extremely heavy, but also somewhat ethereal. Despite that, it's still not overly-fussy, rather like Fanny herself. If you like Pride and Prejudice and haven't seen Lost in Austen yet, I cannot recommend it to you enough. Anyway, there are several Mr Wickhams, all of them in exceedingly dashing uniforms, most of which are quite similar to each other. I have chosen this one mainly because I love Tom Riley's subversive portrayal of the character, but also because I'm fairly certain that gold collar is the largest one you'll see on any Mr Wickham (compare with Adrian Lucas and Rupert Friend). It seems flamboyant and at the same time friendly, and I like that. Look at him, he's such a dapper older gentleman. Perhaps he owes this partially to the fact that he's very well-off, but there's still a lot of good taste going on here. He might be slightly infirm and wary of his health (and everyone else's) but his cane simply looks stylish, while his scarf to fend off the cold is a lovely pattern and goes his waistcoat wihtout being all matchy-matchy. I still haven't decided how I feel about Isabella as a character. Obviously there are reasons to dislike her, though I've always had a bit of a thing for siding with the unsympathetic characters (hence my secret love for Caroline Bingley). This dress however suits my conflicting ideas of her character perfectly. It's bright, matching her energetic personality, and fairly flirtatious without giving too much away. Also Carey Mulligan could probably wear anything and look good. Nah, just joking. There's not much remarkable about this shirt, but how could I make an Austen post without a bit of damp Colin Firth? I like all the other costumes, and I do think Romola Garai is capable of pulling off all sorts of styles, but I just did not like this hat. And it kept coming back, which was really annoying. It's not even that bad, I just took against it for some reason. I think it's because she would sometimes wear it with just a dress and no coat, and it looked bizarre. What are your favourite Austen costumes? How could you post an Austen-related post without some Alan Rickman? Haha, great post though! Love this! Makes me want to spend the week snuggled on the couch surrounded by the classics, and with BBC adaptations playing on a loop in the background. 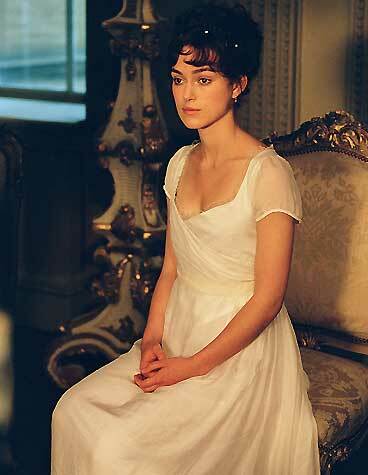 I love the fashion in Pride & Prejudice (the more recent one). Elizabeth's dress is one of my favorites too. It's so simple and feminine.